NoMad is the perfect spot for a romantic destination. 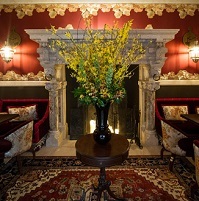 Chef Daniel Humm and Will Guidara have created a casual yet elegant space with grand rooms and innovative cocktails. Dinner begins with Fruits de Mer featuring the chef's selection of raw seafood, Caviar and accompaniments inspired by New York City, and Caesar Salad with a classic creamy dressing. Signature dishes for two include The NoMad Roast Chicken stuffed with foie gras, black truffle and brioche, and a 32-Ounce RibEye that is dry-aged for 80 days with shallot herb butter & sauce au poivre. Desserts include Baked Alaska for two with tableside flambe. 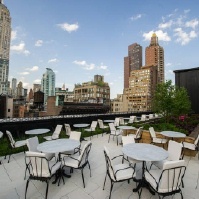 In warmer weather, there is the Rooftop at NoMad that has the feel of a private club. 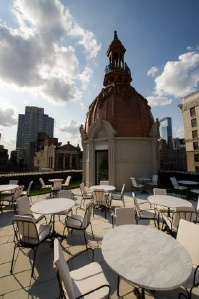 Upstairs, the first course is served at a cocktail lounge, while the rest of the courses are served al fresco, at a circular marble table overlooking the city.